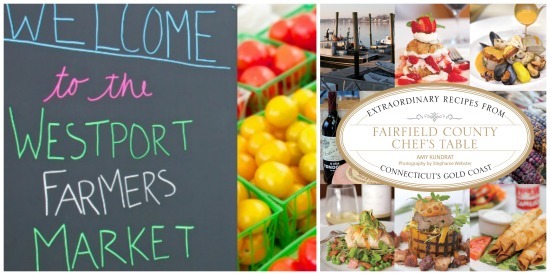 The Westport Farmers’ Market (WFM) invites you to meet the chefs & authors behind Fairfield County Chefs Table on August 28. They will be signing books and meeting readers from 11 to 1 pm at the Westport Farmers’ Market Thursday location at 50 Imperial Avenue, Westport. The Market runs from 10 am to 2 pm. Amy Kundrat and Stephanie Webster, the author and photographer of the book Fairfield County Chef's Table, will be at the August 28 market from 10:00 – 2:00 to sell and sign copies of their new book. The two women behind CTbites.com embarked on this book project with over 50 participating chefs to profile the region's favorite restaurants and share some of its most beloved recipes. They will be joined by several chefs who are profiled in their book, including Bill Taibe of leFarm and Whelk, Matt Storch of Match and Chelsea Restaurant, and Glen Collelo of Catch a Healthy Habit, who will be on hand to sign the book and meet market visitors. More information at www.fairfieldcountychefstable.com.